BETWEEN: Sheffield Aero Club Limited AIRPORT ATC Unit of Netherthorpe Airfield, Thorpe Salvin near Worksop, Nottinghamshire. S80 3JQ. 22 Turnshaw Road, Ulley, Sheffield S26 3YG. acting on behalf of members and guests as a Small Unmanned Aircraft (SUA) Operator, collectively known as ("The Parties"). Annex 1 will be signed by all members to say they have received a copy of this agreement and they fully understand the need to comply. The purpose of this MoU is to provide clear and unambiguous permission for the operation of small unmanned aircraft (SUA) of less than 20kg dry weight within the Flight Restriction Zone (FRZ) of Netherthorpe Airfield at the location and times specified in this MoU and under the conditions agreed between The Parties. CAP 1763 (Air Navigation Order 2018 and 2019 Amendment Order) requires that formal permission is given by the relevant Air Traffic Control Unit (ATC Unit) before small unmanned aircraft, are operated within the FRZ of a Protected Aerodrome. This document represents the formal permission between The Parties. All terms and definitions used in this document are as per those used in the Air Navigation Order as amended by CAP 1763. The area of operation of the SUAs will be contained in a semi circle of radius 0.4 nm (from centre of NASA runway) with the straight line end points being located at 53.352729, -1.203416 and 53.349962, -1.188696. (Woodsetts Road). The launch/landing site elevation above Mean Sea Level (MSL) is 359 ft and the SUAs will be operated to a maximum height of 1000 ft above the point of launch. The normal days/times of operation will be 7 days per week. 11:00 to 20:30 local. In the event of any concern about potential conflict between an SUA and full size aircraft that may occur or the safe operation of the SUA then The Parties will do all they can to collect and protect relevant data and witness details to assist any subsequent investigation. Where and if appropriate Mandatory Occurrence Reporting is required of the SUA operator or SUA pilot this will be fulfilled via the British Model Flying Association Head Quarters by the SUA operator/pilot. 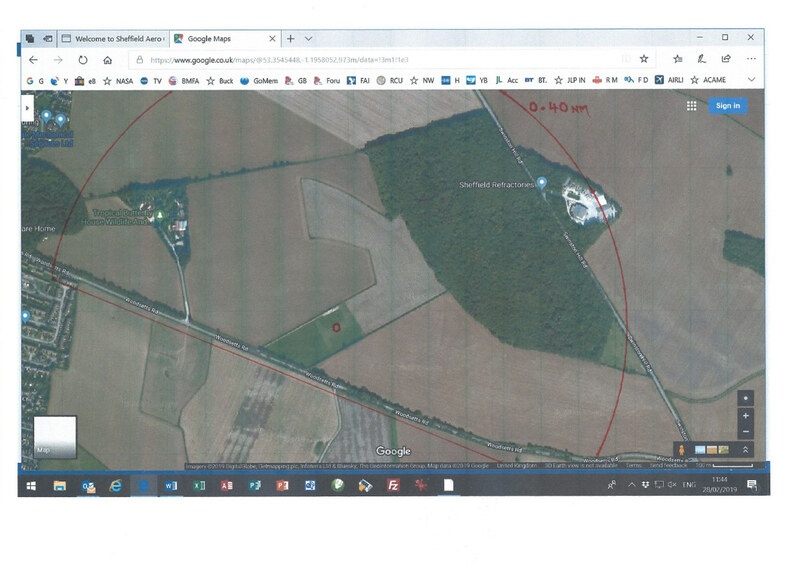 The Netherthope Airfield ATC Unit will provide details of the site location and operation to any relevant Aeronautical Information Services (AIS) necessary. The North Anston Society of Aeromodellers will undertake to inform Netherthorpe Airfield ATC Unit of any significant change in the information about the SUA operation relevant to AIS notification. In the event that a major Emergency or Incident is declared at Netherthorpe Airfield and cessation of operations of the SUAs is required then the ATC Unit will contact Ashley Hoyland 07734 256436 and every effort will be made to land/ground all SUAs operating at the site as promptly as possible. Both Parties agree to review the contents of this MoU as a result of any significant change to this information.